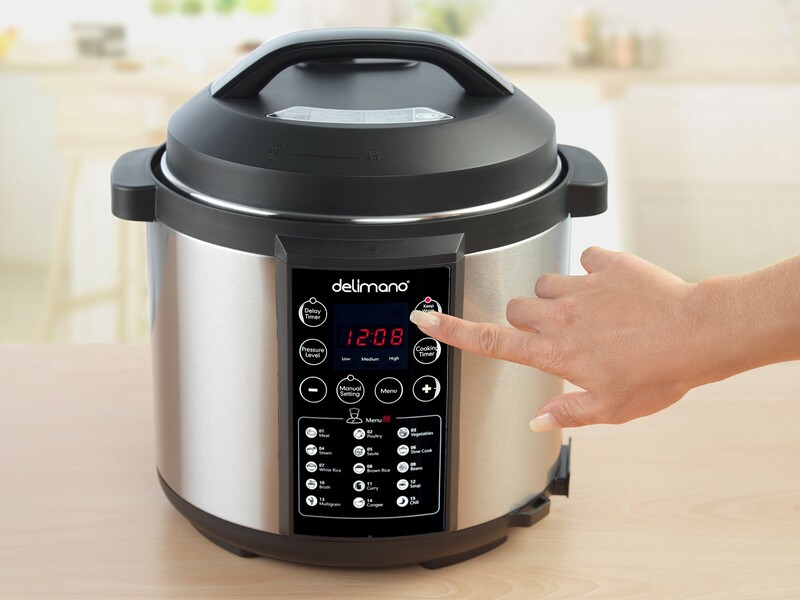 With Delimano Electric Pressure Multi Cooker you will cook meals faster, with smaller energy consumption and more vitamins and minerals preserved. It has integrated multiple safety systems and 15 preset programs for creative and stress-free cooking. 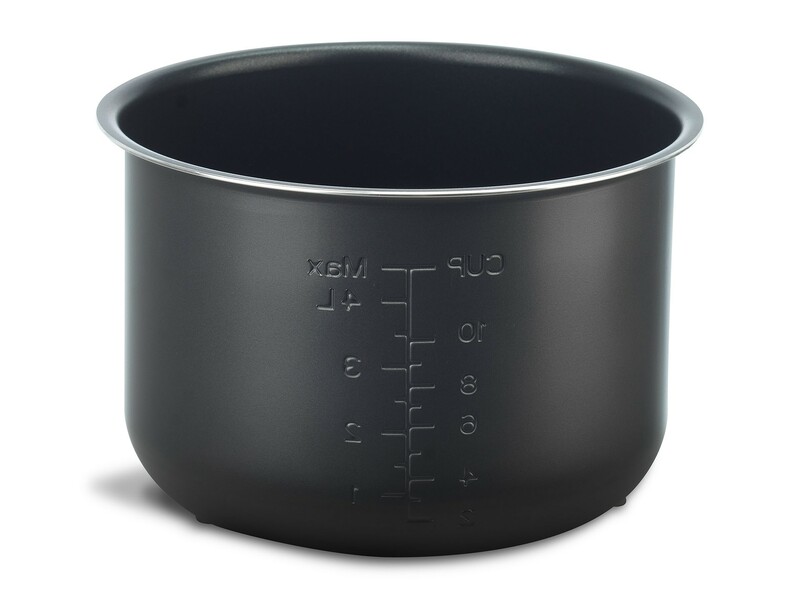 The capacity of 5,5l is great for big family meals from meat and poultry to soups and stews. 1000W power will handle any cooking challenge. 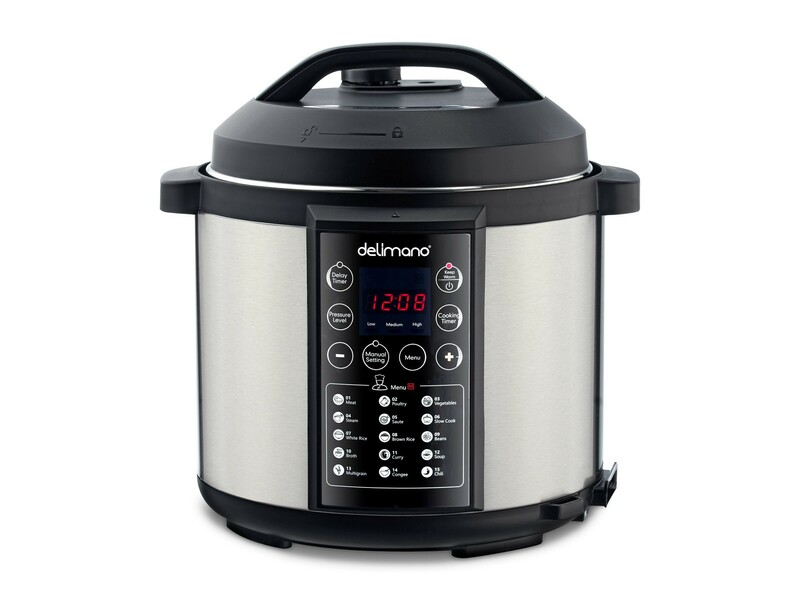 Delimano Electric Pressure Multi Cooker 5.5L PRO can prepare quick, tasty, no-hassle meals. This smart kitchen appliance can prepare meals up to three times faster than regular cooking - without heating up the entire house. 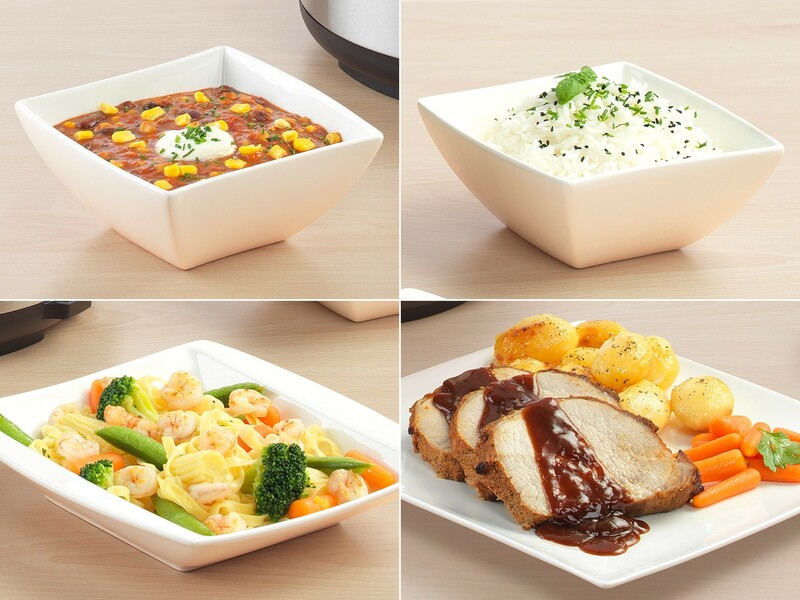 Now you can treat the family to a home-cooked meal, and have time to sit and enjoy it with them too. 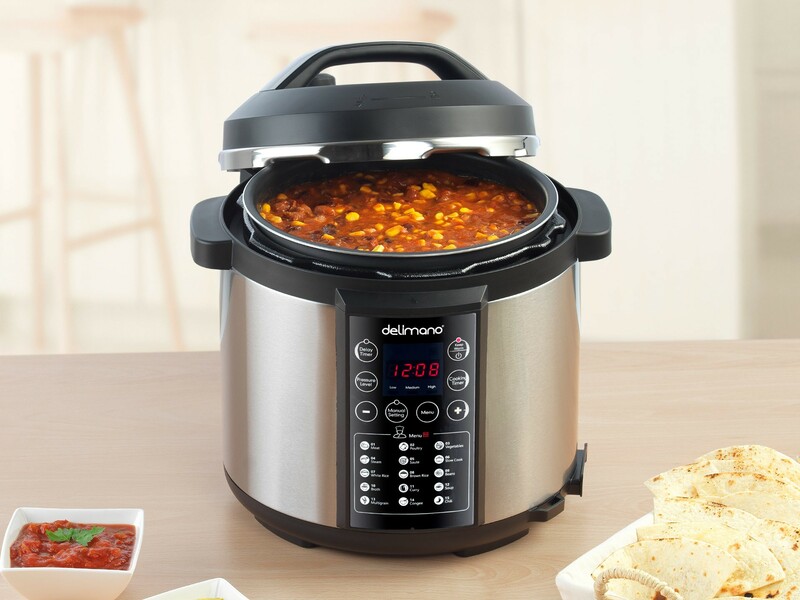 Delimano Electric Pressure Multi Cooker 5.5L PRO is your quick-and-easy cooking solution. It does everything for you - rice, soups, porridge, steams, stews, chili or curry. Its oval shape and generous 5.5 l capacity make it perfect for preparing larger meals and with a 1000 W power, it will handle it easily. 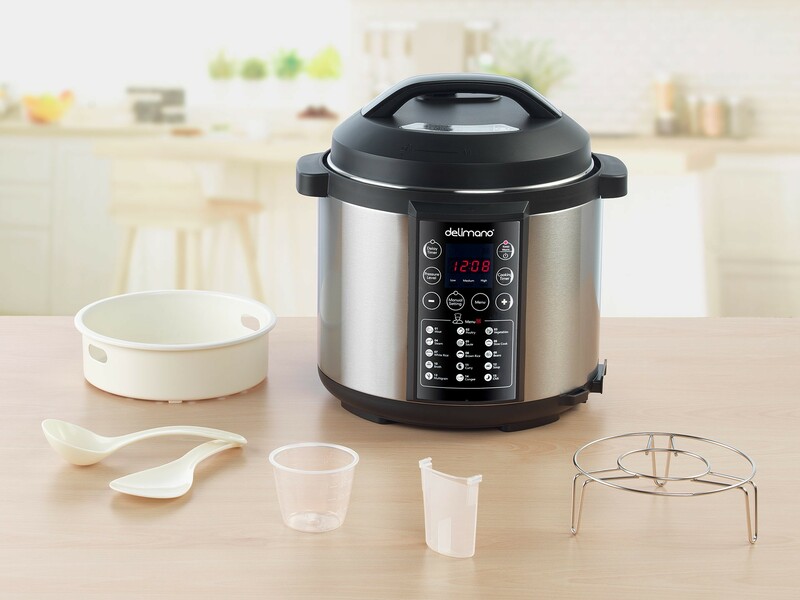 This Multi Cooker is packed with advanced features to make your life easier. The integrated computer controls cooking time and pressure, so no human presence is needed and you have more time to spend on other activities. It has multiple safety systems andcool-touch handles for easy and safe serving. The best of all its features is an adjustable timer with a keep-warm and delay functions. With the delay function, you can prepare ingredients in up to 24 hours in advance and come back home to a freshly cooked dish. The keep warm function can be set up to 2 hours and is great if you need to delay serving.